Thermolon Granite is not just a non-stick coating: it is a healthy and environment-friendly alternative to traditional non-stick coatings. Thermolon Granite is PTFE-free, PFOA is not used as a raw material, it does not release toxic gases when frying at high temperatures and is extremely resistant to overheating. For the production of this new non-stick coating technology – compared to traditional non-stick coatings – twice as little energy is required, resulting in a 60% reduction of CO2 emissions. The ceramic coating has a noticeably higher heat-resistance and combines perfect non-stick properties with ease of use. 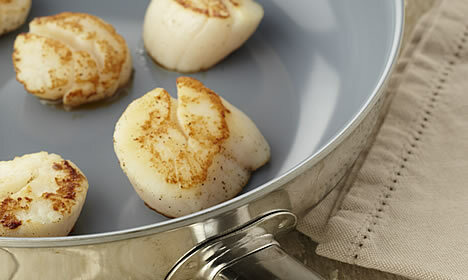 The excellent non-stick properties of Thermolon Granite and the optimal heat conduction of the Demeyere technology, make the pans with this non-stick coating ideal for quickly frying ‘delicate’ products such as fresh foie gras, delicate fish types (such as monkfish), scallops etc. Also delicate vegetables, such as wood mushrooms, can be perfectly sautéed with a little bit of fat. The combination of a Demeyere pan that has excellent heat conduction and an ecologically responsible and high-quality non-stick coating makes the Demeyere pans with Thermolon Granite a product that should not be missing in your kitchen. You will be saving both energy and the environment. • To keep the non-stick properties in tip-top shape, simply clean the pan with a little detergent and a soft sponge or cloth. Never use a scourer or abrasive products. We also advise you never to clean the pan in the dishwasher. • It is important to clean pans with a Thermolon™ non-stick coating each time after use, and sometimes it is necessary to remove the fat more thoroughly: - Test the quality of the ceramic layer by wetting the pan with pure water and holding the pan vertical: if the water runs off without leaving any droplets, you do not need to further clean the pan. - If droplets stick to the ceramic layer, you need to clean it/remove the fat more thoroughly. • Metal kitchen utensils can damage the non-stick coating. Always use nylon, silicon or wooden kitchen utensils. • Do not stack the pans when putting them away. If you need to because of lack of space, use pan protectors. • Although the Thermolon Granite non-stick coating can withstand high temperatures, it is always best to use a moderate temperature for frying. The ideal temperature for frying is about 220°C/425°F for searing and colouring and between 160°C/320°F to 180°C/355°F for cooking and frying for longer. Over 250°C/485°F food can carbonise which renders it unsuitable for consumption. As the Demeyere pans conduct and retain heat extremely well, it is recommended that after the pan has been heated, you reduce the heat by 30 to 50%. • Even when frying in a pan with a non-stick coating, you will still need a little fat. The choice of fat is very important. Preferably use: - butter, clarified butter or butter oil - margarines that are suitable for frying (regular or liquid) - oil that can withstand high temperatures: peanut oil, corn oil, rice oil and specially blended oils. Attention: avoid the use of extra virgin olive oil! This type of oil starts to burn at a temperature of 150°C/300˚F. You could use refined olive oil for a short, non-intensive frying spell (max. 180°C/350˚F).